Inner Missing were formed under the moniker Odium in early 2008. Back then they were a duo. Soon after, they changed their moniker into the current one, and they evolved into a real band. Throughout the years, Sigmund and his crew recorded several full lengths and EP’s / singles, and their style evolved from old schooled Doom-Death into a more experimental form of (Traditional) Doom Metal. 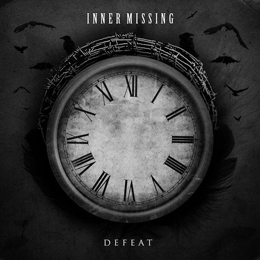 That evolution continues with Defeat, Inner Missing’s fourth studio full album. As from the very first song, it is clear that this permanent evolution has not come to an end yet. The Secret starts with acoustic guitars, joined by atmospheric keyboards and melodic bass lines, and slowly turns into a melancholic Metal piece with quite some references to the melancholic side of the Doom-scene. Nice are the leads, creating a brave sphere. Than it all turns into a more Progressive way, with avant-garde riffs and absolutely unique and unusual vocals: a somewhat tragic / dramatic mixture of operatic voices and plaintive crooning. There are no more grunts or screams this time either. When the whole gets more intense, I mean when all instruments join in (take notice of the sublime keyboard passages), this track really surprises undersigned for being so distinctive from what we’re used to. It was no coincidence, this opening song, for the whole Defeat-album brings forth this alternative view on (Traditional) Doom. In general, and in comparison to the past, this stuff sounds lighter (which does not mean that it is less dark! ), and despite being recorded and released one year only after Perjury, the Gothic-elements have decreased (at least when it comes to the instrumental structures, not in reference to the sorrowful, woebegone atmosphere) in favour of the Progressive attitude I mentioned before. The increased experimentation might work confusing, I think, and it makes Defeat a more difficult album to get through. At the other hand, the multi-layered structures are a challenge and once you are able to get deeper into the concept, it becomes more and more interesting. There’s quite some variation too, with highly technical pieces interacting with neo-classic moments, or with the search for balance in between avant-garde experiment and inherent tradition.